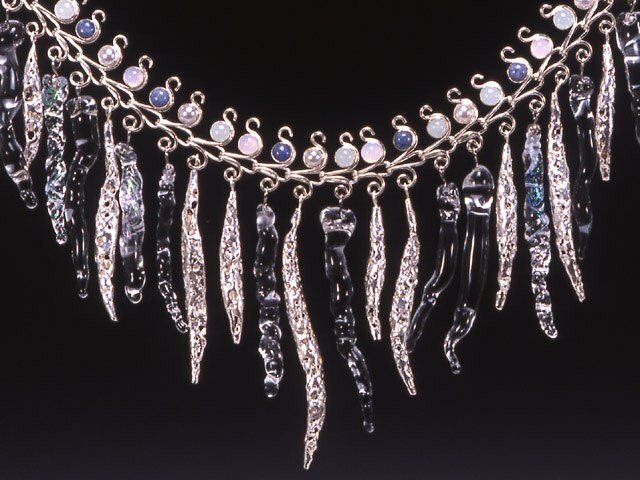 Sterling, fine silver, glass.14-16" choker. This necklace is not for the timid! It's light and bright. The fine silver elements are formed and fused from fine silver, the glass is flame worked in clear and dichroic glass to give it extra shimmer. The stones include glass pearl, aquamarine, blue chalcedony, and sodalite. This custom piece is made to order. Earrings are also available and start at $180.